Whether you’re remodeling your bathroom and kitchen yourself, or using a professional contractor, ensuring that the plumbing connections are done correctly and up to code is essential. Master Plumbing & Mechanical can work with you or your contractor to make sure your new, updated kitchen and bathroom not only looks great, but performs great too. Precise adherence to building codes that include explicit space around fixtures. Construction and placement of walls and plumbing drain pipes, which requires a licensed plumber. Installation of the tub and/or shower with placement of a heavy drop cloth to protect them while plumbing the water lines. Installation of toilet, sink, tub and shower, including selection of fixtures. Single-head spray models have adjustable nozzles with patterns that distribute the spray and a small lever to change from a fine wide spray to a concentration of streams of water. The rain shower is a large fixture with a flat surface that squirts the spray straight down on the user. Dual/multiple showerheads have more than one nozzle under the control of a single set of handles. Some showerheads allow for hand-held operation of a flexible hose, which is great for washing hair (especially good for individuals with limited mobility or those who sit in the shower). Body sprays have a unique set up with several sprayers built into the shower walls (requiring specialty piping of water supply lines). You have hundreds of choices for hardware when remodeling your bathroom or kitchen. A consistent look through the entire room is a must, and you can achieve that look by selecting all fixtures, faucets and miscellaneous items from one manufacturer, all with the same finish. Finishes include chrome, nickel, stainless steel, bronze, brass or porcelain. Brush and matte finishes are better for hiding splashes and fingerprints. 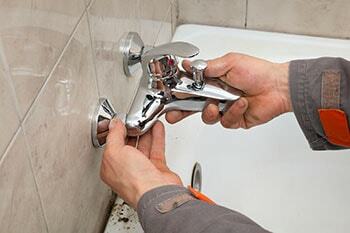 Master Plumbing & Mechanical services the Washington, D.C. metropolitan area. Contact us for assistance with all your plumbing concerns during kitchen or bathroom remodeling. Fill out the information below and we will get in touch with you!